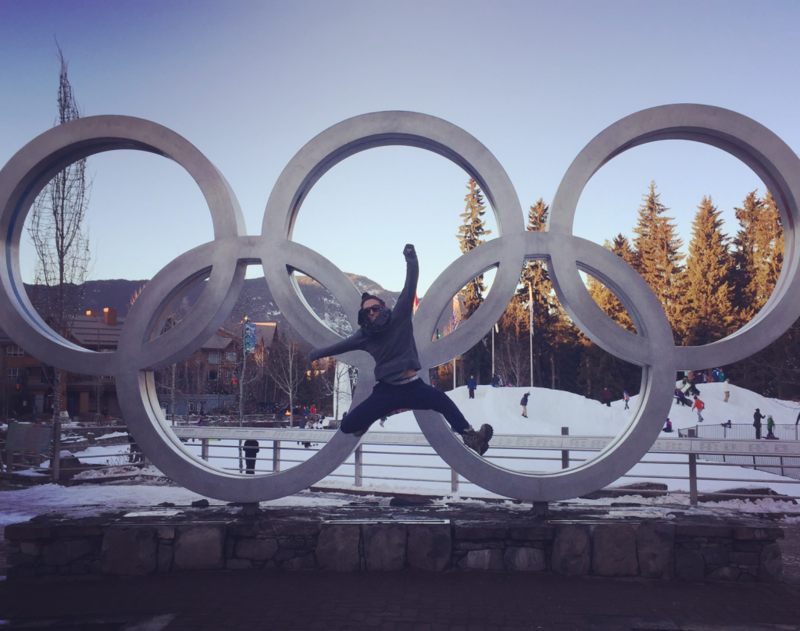 Adecco's own Veronica Day discusses Skeleton, her sled, athleticism and her journey to Olympic qualification. My name is Veronica Day, I’m a Skeleton athlete and I also happen to work for Adecco with the United States Olympic Committee’s Athlete Career and Education Program. Don’t know what skeleton is? It’s a fast winter sport where athletes travel down a mile-long ice track at speeds exceeding 85 mph. We also do it face-first on a glorified lunch tray. This fall I purchased a brand new sled for the current skeleton season. I would not have been able to purchase the equipment without the help of Adecco. After working for Adecco for the past 2.5 years, I can say firmly say that this company is 100% behind my goal of becoming part of Team USA and qualifying for the Pyeongchang 2018 Olympic Winter Games. My employer believes in both me and the Olympic values of excellence, friendship, respect and giving 100% to be your best! 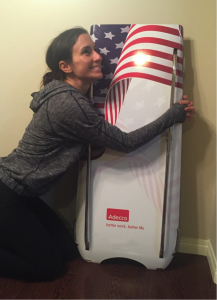 Adecco has a long history of helping athletes in the USOC’s Athlete Career and Education Program and now they are helping me by contributing funds to help me purchase this upgraded skeleton sled! Olympic sleds are like cars. The building of a sled is complex and my new racing equipment has positively affected my sliding and racing. There are a few variables that dictate how fast you can get down the track and one of them is the quality of equipment that you own. Just like cars, there are varying levels of quality and a lot of it comes down to personal preference and cost. A few years ago I purchased a sled from a recently retired slider. It wasn’t made for me, but it was a great sled. It was impossible to bend which was a good thing because I was just learning how to slide and still hitting a lot of walls. With the 2018 Olympic Winter Games looming, I knew I needed to upgrade my equipment. I met up with Richard Bromley in Canada and spoke to him about the upgrades he’d make to the most recent version of his sled, the X18. Now here was the tricky part. How do I raise the funds for a skeleton sled? Sleds can run anywhere from $4000-$12,000. These finely tuned pieces of equipment don’t look like much, but rest assured, underneath that tape and foam padding is an exceptionally engineered piece of racing equipment. The sled makes the athlete. So, how what goes into making a skeleton sled? A lot, actually. Richard Bromley has multiple world class athletes test his equipment before he decides to sell the sleds to the public. Some sleds are welded together, but the one I purchased is machined together by steel that is unbendable. It’s the souped up version of my last sled in every aspect. The biggest thing I immediately noticed about this sled was how much more comfortable I was on it. When you are travelling face first at 85 mph, the last thing you want to be thinking about is how that piece of steel is jabbing your hip uncomfortably. Every saddle needs to be adjusted for each individual’s body. This means individually moving the top pieces around to fit my torso. It can get pretty complicated and I am glad I had it personally tuned for me by the sled maker. Once the sled it fitted for you, it’s up to the athletes to pad the whole thing. This sounds easy, but it’s actually the worst kind of arts and crafts project. It entails hunting down foam that’s light (and won’t make your sled overweight) and also waterproof (so it won’t absorb the snow). It then means cutting out a few dozen pieces of foam into perfectly shaped pieces to fill in all of the gaps on the interior of the sled. Needless to say, it makes a massive mess. After it’s all even, you can safely take the sled down the track! I took my first runs of the season in mid October in Lake Placid. This sled is silent compared to any other sled I’ve ever been on. I feel like Aladdin on a magic carpet. I had a personal record in Lake Placid and I’m confident there’s way more in the tank. The season thus far has certainly had its ups and downs, but I most recently placed 3rd in two races in Calgary on the new sled, my highest finishes ever in an international race! I could not have done it without the help of Adecco. This sled would not have happened and it was certainly the right choice for making strides towards my Olympic endeavors. Thank you Adecco!